Tag Archive | "Combined Accident Reduction Effort"
More Michigan State Troopers will be patrolling the highways over Thanksgiving to help prevent crashes and injuries during the second deadliest time of the year for traffic crashes. Photo courtesy of Michigan State Police. The Thanksgiving holiday is almost here and that means travel, food, family and football. 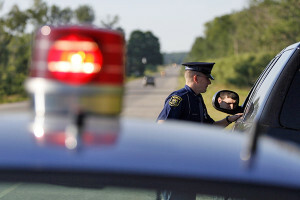 As motorists prepare to hit the highways, the Michigan State Police (MSP) is gearing up for the annual Operation C.A.R.E. (Combined Accident Reduction Effort) traffic safety initiative Nov. 23-27, 2016. Thanksgiving is the second deadliest holiday in Michigan for traffic crashes. In 2015, there were 11 fatalities, five of which were pedestrians, during the holiday period. In 2014 there were six traffic fatalities during the Thanksgiving holiday weekend, the lowest number in more than 30 years. Beginning Wednesday, troopers across the state will conduct high-visibility enforcement focusing on impaired driving, seat belt use, careless driving and speeding. Extra patrols are paid for with federal traffic safety funds coordinated by the Michigan Office of Highway Safety Planning. Enforcement is supported by the Give thanks. Drive safely. public awareness campaign that includes a public service announcement available at www.youtube.com/michstatepolice. With the arrival of winter weather, motorists are also encouraged to take extra precautions when driving in snowy and icy conditions and to place an emergency preparedness kit in their vehicles. To learn more about creating a kit, go to www.michigan.gov/miready.